Our buddy Scott is here to tell you a little about this new book called Trail Magic and the Art of Soft Pedaling: Mountain biking 3,000 miles along the Continental Divide. 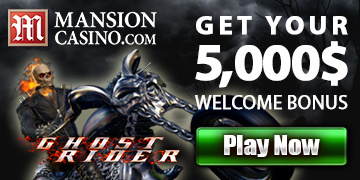 Oh, and he’s giving you the opportunity to win a copy as well. The last time Scott Thigpen had been on a bicycle, he was a 12-year-old kid with a love of Star Wars and Disney. Twenty-five years later, he was sedentary and rapidly gaining weight. Hello Couch, meet Potato. It was time for a change, for both his body and his mind. Determined to start moving again, Scott climbed on a bicycle one summer afternoon and started pedaling. By the end of the driveway, he was gasping for breath. A year later, Scott was still trying to stay upright on a mountain bike when he watched Ride The Divide, a movie about an event so daunting, so exhilarating, so tough that few attempt it. But Scott couldn’t stop thinking about it. The Tour Divide, a nearly 3000-mile mountain bike race along the spine of the Continental Divide, was his new dream. Known as one of the toughest races in the world, the Tour Divide is an unsupported off-road event. If your tire is flat, you fix it. If you run out of water, you must find more. If you’re caught in the middle of nowhere, exhausted and blurry-eyed? Find a spot to nap amidst nature and try not to bother the Grizzlies. Starting from zero, Scott trained for two years while maintaining a busy family life, a freelance career illustrating for the Wall Street Journal and The Atlanta Journal Constitution, and a teaching gig at the University of Alabama at Birmingham. Scott was preparing for the ride of his life. In June of 2013, he climbed on that bicycle again, this time to race against 167 other people from all over the world on a trek that would take him from Canada to Mexico in 22 days. Captured through Scott’s vivid words and wondrous illustrations, this is the tale of one man’s quest to break free of the typical life and conquer his wildest dream. 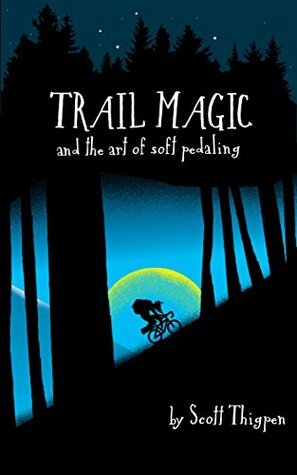 You can purchase Trail Magic and the Art of Soft Pedaling on Amazon. Scott has two copies of his book to give away here on Loving the Bike. He’d like you to enter by leaving a comment explaining your “best human achievement” or “how I climbed my own mountain.” Get your comment in by the Noon on Monday and you’re in to win. After having a heart attack in 2004 I’ve become an avid cyclist, both mountain bike and road. My biggest mountain I’ve climbed so far is completing a two-day, double century (TOSRV). My mountain? It is more the descent that is memorable. November 1, 2010 I weighed 305lbs. I thought my best days were behind me. Chronic gout, borderline hypertensive, and a couple other issues. I knew I had to make a change. I had to loose some weight. First thru diet and then thru biking, I dropped 120 lbs by September 10th, 2011. Competed in my first mountain bike race, Snake Creek Gap, that January—on my ’94 Giant Yukon. My first metric road ride on the same bike that spring. Discovered gravel racing now so the adventure cycling/endurance racing is next on my list of things to do. I haven’t given up pushing how far I can go ever since. Cycling has really changed my life. Congratulations, Tom. You win a copy of Trail Magic and the Art of Soft Pedaling. 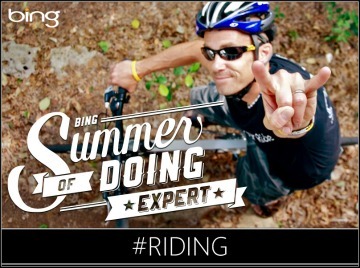 Please e-mail your contact information to Darryl@lovingthebike.com. Wow amazing story! Would love to see that movie Ride The Divide. Never heard of that ride before and it sound incredible, but I’m not a really good cyclist (tired after 2 hours today) so I don’t think I’d be up for that one. I like the title of the book though… “the art of soft pedaling”. To me that sounds like more my style. I have a similar story, yet not as amazing as Scott’s. Five years ago my dad was diagnosed with high blood pressure and type 2 diabetes. He started walking and started turning things around. Three years ago he bought a bike and started riding. After three years, he practically reversed everything and is doing great. That made me look in the mirror and realize I was following right into where he was. Two years ago I bought a hybrid bike and started riding. I had a hard time doing 5-10 mile rides but kept working. I out grew that hybrid quickly and bought a proper road bike. So far it’s been 2 years, I have ridden over 4000 miles and lost nearly 100 lbs. This year I have done multiple half centuries, a metric century and recently did a solo unsupported full century ride. The bike really change my life and now I can’t get enough. I ride almost every day. It was a hot day for WA state and I tried to keep up with my water intake. At the last food stop during my first century ride I bonked; hard. I was nauseated and my legs had little feeling in them. I slowly moved over to the water container and filled up a water bottle then searched for a bit of shade amongst the rolling wheat fields of Eastern WA. I kept thinking if my wife drives the course and sees me here I’m done; I’ll load the bike on the rack and go home. 10 minutes turns to 15 and a elderly lady walks over to me, smiles and hands me a bagle with peanut butter. “Try to eat this, it helps me during harvest time,” “Thank you” I said and forced a pained smile. As the bagle went to work I felt my legs coming back to life. After about 20 minutes I slowly climbed back in the saddle. The next 20 miles went by slowly untill that last mile and I could see the finish line. I felt a surge of energy from both the peanut butter bagel and knowing I just peddled 112 miles in under 8 hours. Thank you bagel lady! Congratulations, Keith. You win a copy of Trail Magic and the Art of Soft Pedaling. 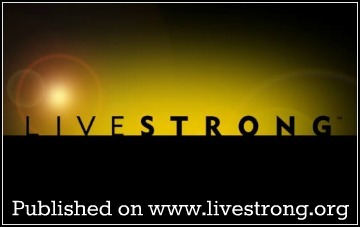 Please e-mail your contact information to Darryl@lovingthebike.com. Thanks Darryl email is sent! How I climbed my own mountain! I was hit by two other cyclists during a race and ended up knocked out on the side of the road. I had my first ride in an ambulance and had the following: 4 broken ribs, a concussion, lots of road rash, and vertigo. My helmet was given back to me in four pieces. I was diagnosed with migraines and because of the vertigo, couldn’t drive for 7 weeks. I was “downsized” from my job months later because I couldn’t sit in front of the computer (the scrolling screen gave me migraines). After being let go, I was out of work for a week. I already had my Personal Training Certification and a big gym was kind of enough to give me a job. I changed my career from Operations Manager to Personal Trainer. I eventually added Group Exercise Instructor and Endurance Coach to my life. It’s the best thing that ever happened to me. I’m able to work with people in changing their lives, achieving their goals, and helping them be happier and more productive people. Oh, and I finished Ironman Florida 15 months after my crash!